Over the course of ten years training teachers to write their own poems in order to pass the craft along to students, McEwen realized that nothing comes easily when life is conducted at a high rate of speed. She draws not only on personal experience, but on readings ranging from literary anecdote and poetry to Buddhism, anthropology, current news, and social history, all supplemented by interviews with contemporary writers and artists. This is a real reader's book, one that stands up as both sustained narrative and occasional inspiration. McEwen espouses the pleasure to be found in slowing down, both for the ease and comfort of the thing itself (taking time to go for a walk, to write down one's dreams, to read, to talk, to pray), and for its impact on creativity. There are chapters on walking, talking, drawing, dreaming, on making space, on pausing/praying, on telling stories. 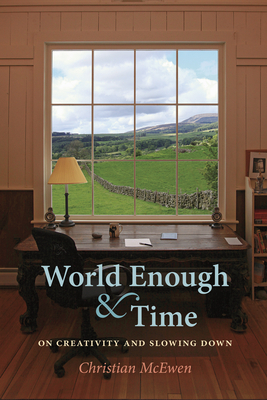 World Enough Time is aimed at the educated general reader, could be used as a creative primer, and will be of interest to creative writing students and artists in every genre. Christian McEwen was born in London and grew up in the Borders of Scotland. She has edited four anthologies, including Naming the Waves: Contemporary Lesbian Poetry, and Jo's Girls: Tomboy Tales of High Adventure, True Grit & Real Life. She has written for the Nation and the Village Voice, and her poems and essays have been widely published. McEwen has taught poetry, environmental literature and creative writing at a number of different venues, including The Scottish Poetry Library in Edinburgh, Williams College, Smith College, and Lesley University. She has been a fellow, several times, at the Yaddo and MacDowell colonies, and currently lives in Northampton, Massachusetts.